Grade 7 Piano ABRSM 2019/2020 C2. Right from the beginning, keep the weight of the individual notes in the thirds even. 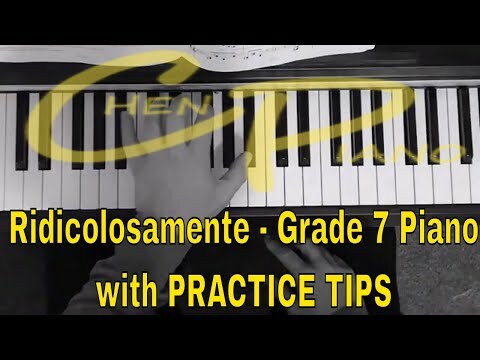 It could be very easy for some of the notes to not even sound at this fast paced, staccato "piano". Also give a little extra weight, not only to the obvious "forte" accented notes, but also to the tenuto notes, from bar 9 onwards. The main technical challenge of this piece is the positioning of the hands. In general, the LH would be placed towards the back of the black keys allowing the RH room in front. Be careful in bars 18 and 19, where roles are reversed, in the former the RH will be "sotto" (under) and in the latter it will be "sopra" (over). At all times, try to be aware of the melodic line, not letting the LH staccato thirds obscure this. This will need special care in bars 32 and 34 where the LH quaver F's could easily be mistaken for part of the accompaniment. Let them stand out, just that little bit more. Also follow precisely the composer's articulation marks such as the staccato quaver just before the legato semiquavers of bars 21 and 29 (an easy one to miss) and the little slur in bar 26. Another place in which the articulation will be commonly missed is the very last note - it is staccato in the LH and long in the RH. Speaking of the ending, in this performance the third chord of the penultimate bar is taken with the LH, although written for the RH. I found this works just as well and possibly easier.